Posted by DN_Kalvothe on Oct. 27, 2017, 3:48 p.m.
Update: Last week we reported the North American physical version of RiME would be coming out on 11/17. We just received word that the shipment from Japan has met another delay coming through customs. The new release date for the physical version of RiME on the Switch will be 11/21. These delays are regrettable and unfortunately outside of our control. We appreciate your understanding and patience during the launch of RiME. In just a few short weeks RiME will be available to play on the Nintendo Switch, and we could not be more thrilled. RiME has been an amazing project to work on, and it has been an absolute pleasure for everyone on the team watching players explore the depths of The Island and themselves. During what seems like only a few months since we re-announced RiME, the passion for the project the players and fans of the game shared was palpable. The creativity that surfaced during the months leading up to launch was such an amazing sight to behold. The number of people who have dedicated their own time to create works of art for RiME is amazing. In April, we held a creative contest, and submissions from all over the world flooded our inbox. It took a long time for our panel of judges to pick the winners. With so many amazing pieces, we decided to take the contest a step further and invited some of the entrants to have their artwork featured in a physical manual that will be included with the retail release of RiME, alongside a download code for the Deluxe Soundtrack. In the interest of transparency and as we approach the final few weeks before the Switch launch, we also wanted to make you aware of a slight delay that is unfortunately outside of our control. Due to unforeseen production delays in Japan (including the effects of Typhoon Lan), we will be pushing the physical retail release in North America back to November 17th (in line with the European digital and physical release). However, the North American digital version will still be available on November 14th as originally planned. We want to send a special thank you to every person who explored our world, and to those yet to do so. Your gracious patience, kind words, encouragement, and love for RiME will be something that stays with us for all time. 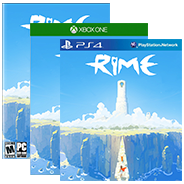 Update: Last week we reported the North American physical version of RiME would be coming out on 11/17. We just received word that the shipment from Japan has met another delay coming through customs. The new release date for the physical version of RiME on the Switch will be 11/21.